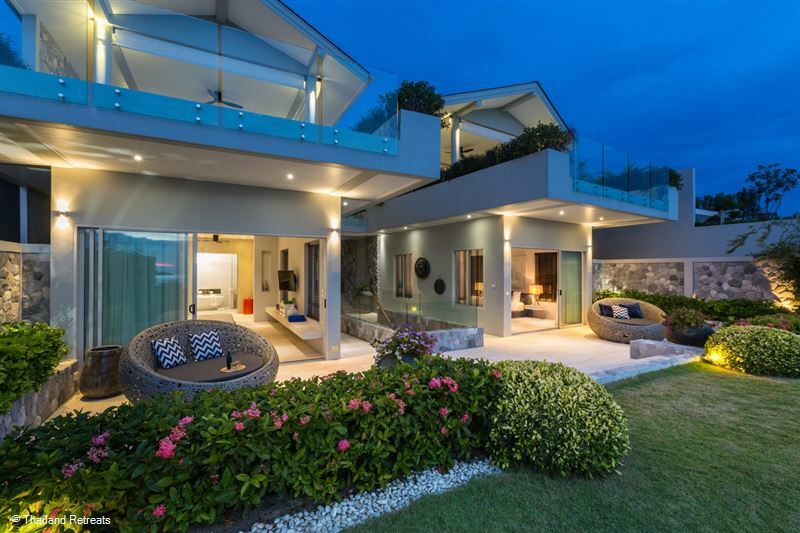 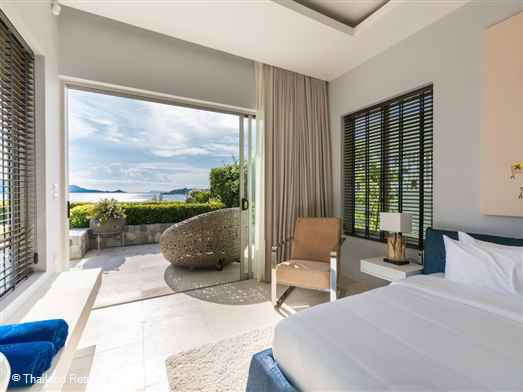 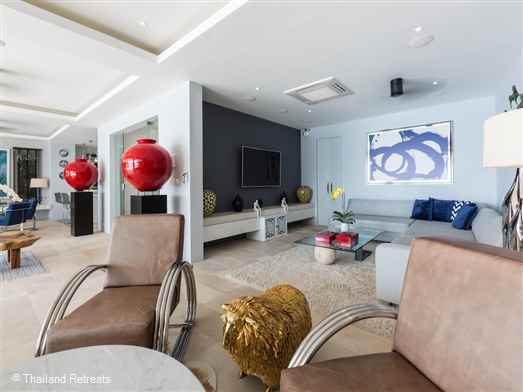 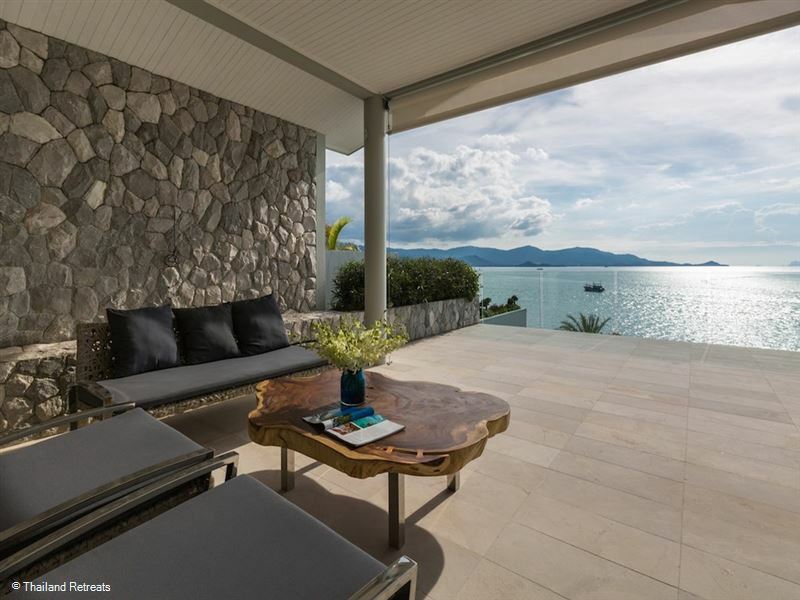 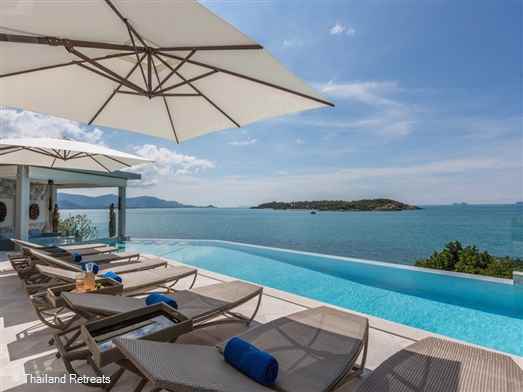 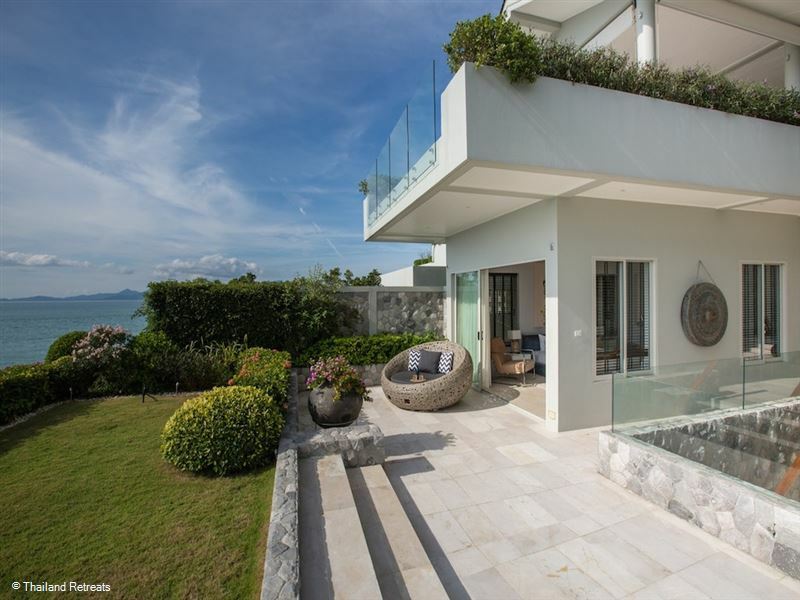 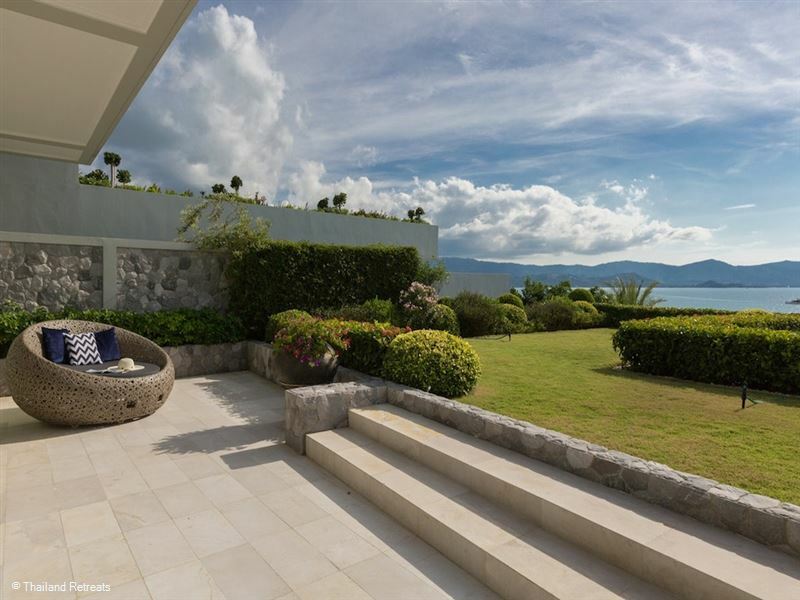 YO Villa is an absolute luxury residence located on the north east peninsula of Plai Laem and offering the best sunset views in Koh Samui. 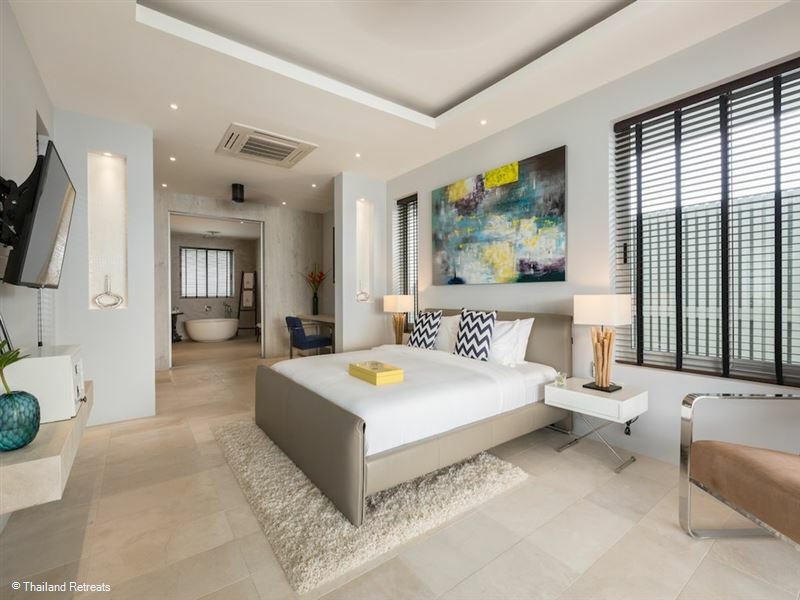 Jaw-dropping location views, enveloping sunset vistas, expansive spaces and stylish high-end interiors infused with the essential five star services. 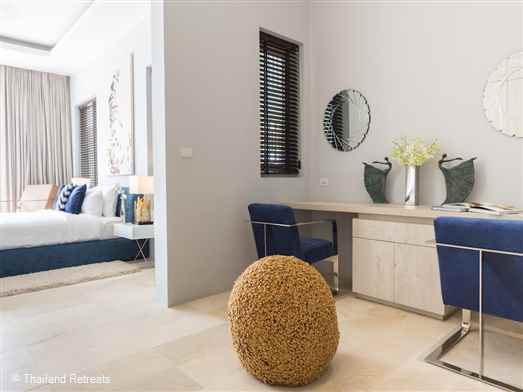 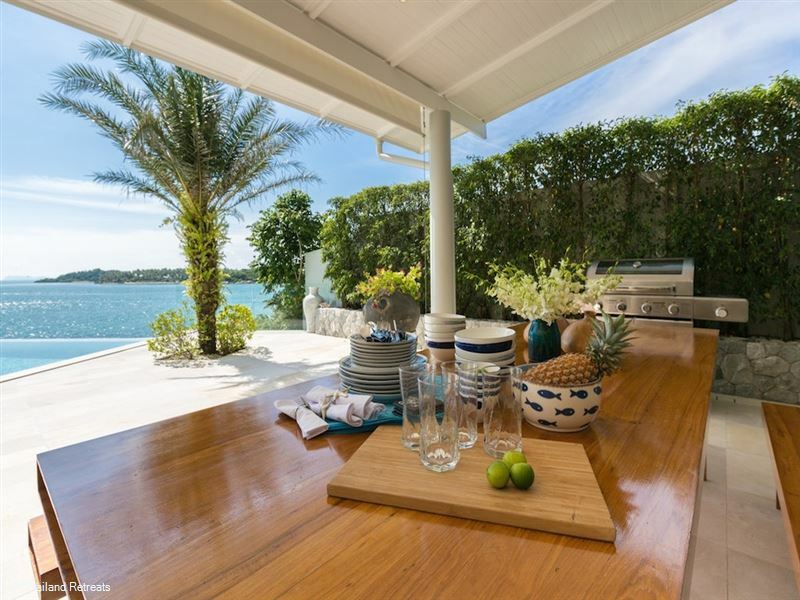 These are the qualities that make YO Villa emulate the warmth and hospitality of a luxurious, fully serviced island retreat with that home away from home feel. 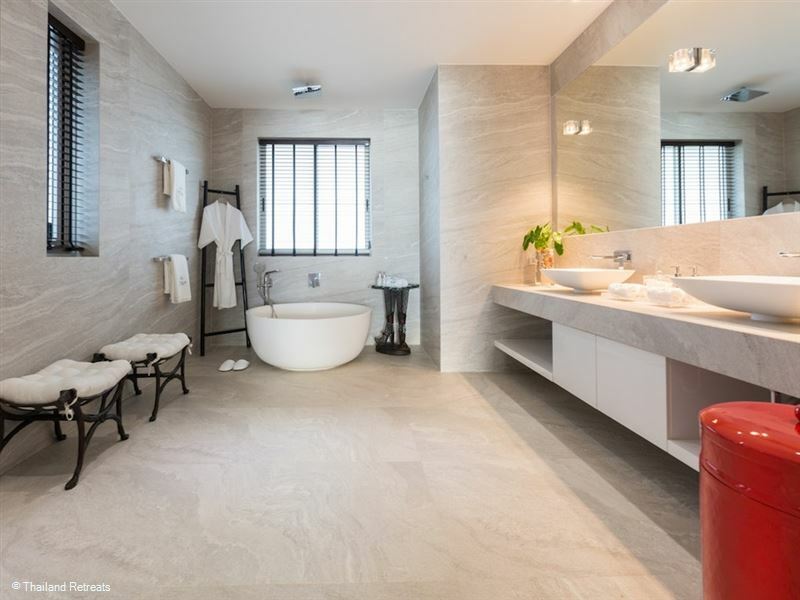 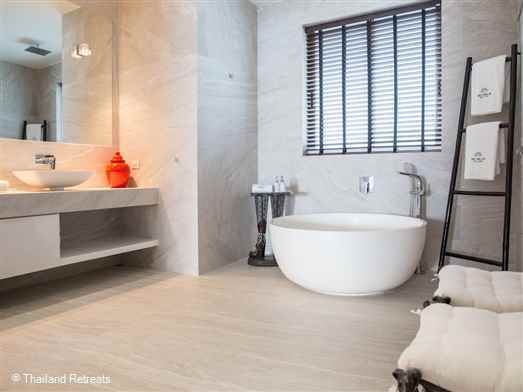 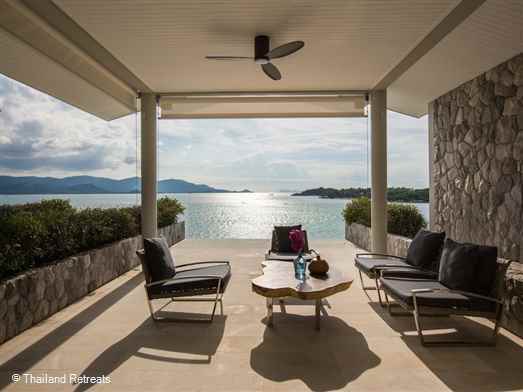 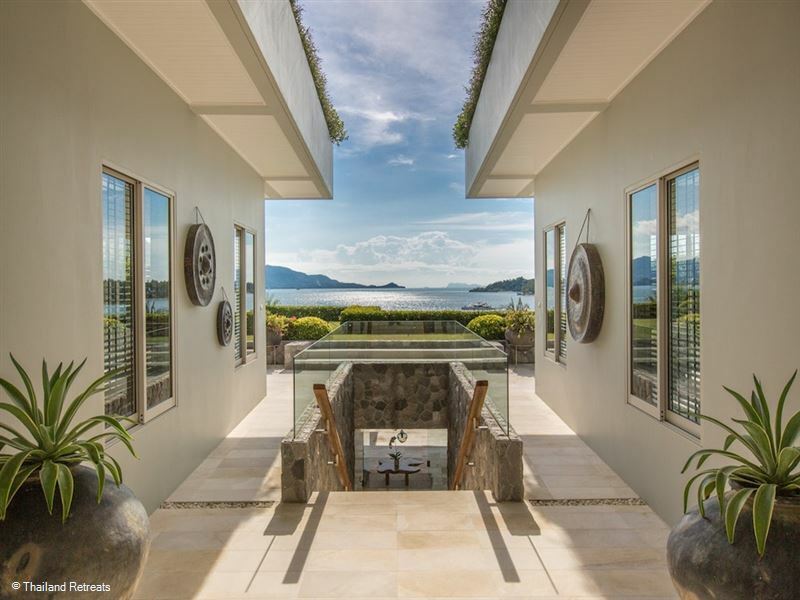 Minimalist horizontal lines accent this contemporary 4 bedroom villa set in 1200 sqm of coastal land overlooking Koh Som and the turquoise Gulf of Thailand. 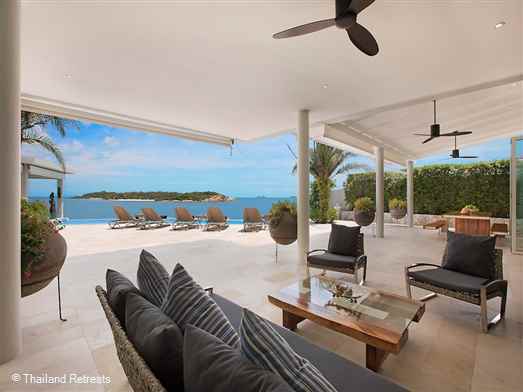 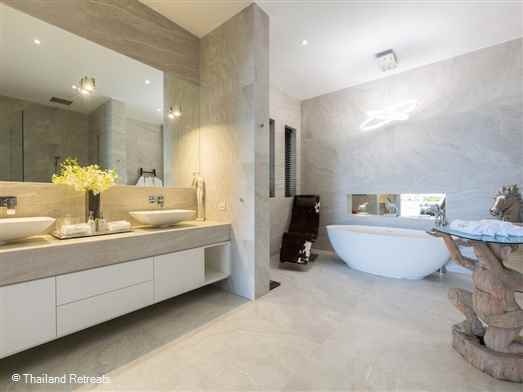 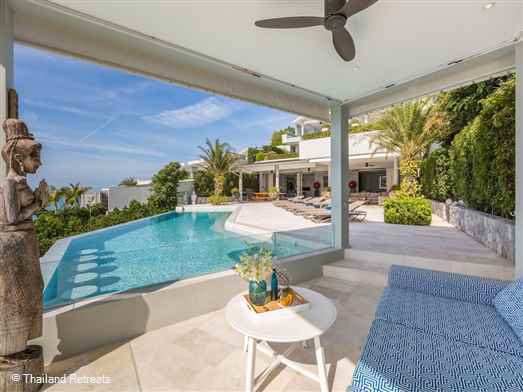 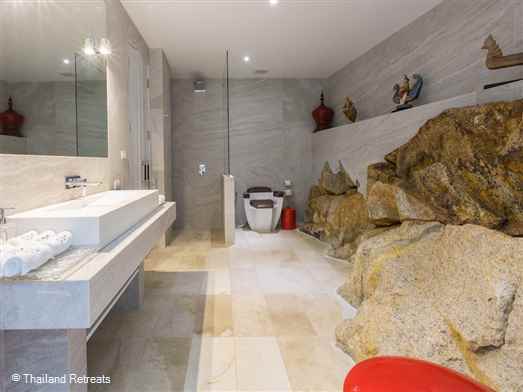 The entire villa is bathed in unending sea views spread over three levels offering the ultimate in luxury island living. Ideal for families and groups of friends alike, the well thought out design offers spacious indoor and outdoor lounges with dining spaces created for total enhancement of their beachfront surroundings. A top-spec cinema room, in-house fitness gymnasium, impressive large pool deck with outdoor Sala lounge and breathtaking infinity edge pool unfolding to views of the neighbouring island of Koh Som, affirm the castaway island feeling this beachside holiday rental exudes. 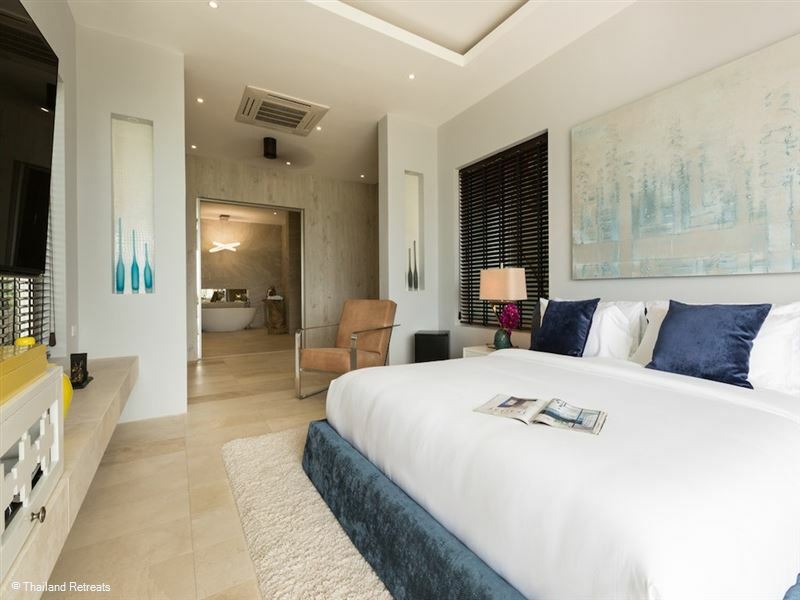 Large King size beds with luxury bed linen take centre stage. 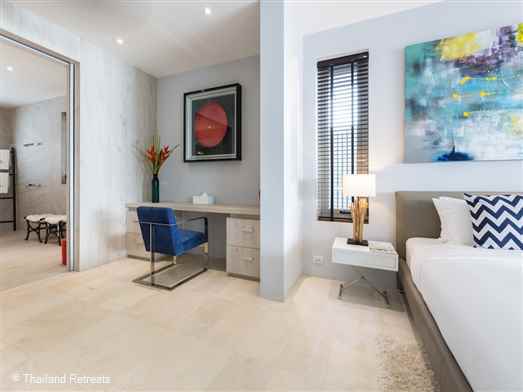 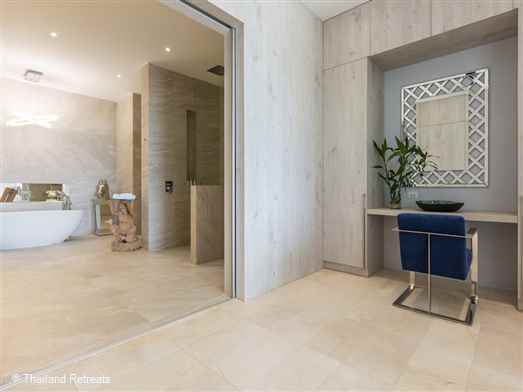 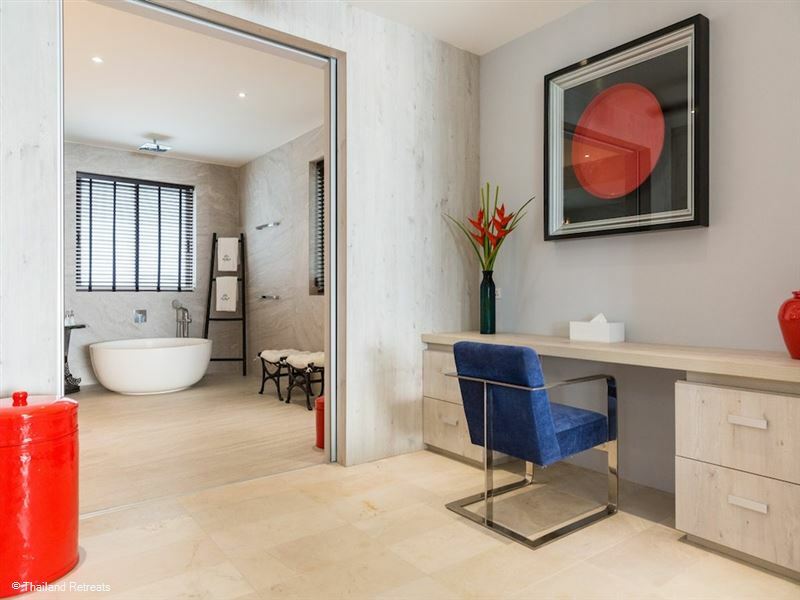 Dressing areas with ample built in wardrobe space have been incorporated in the design and a well thought out study area with large custom made wood desk, offer guests an ideal work space. 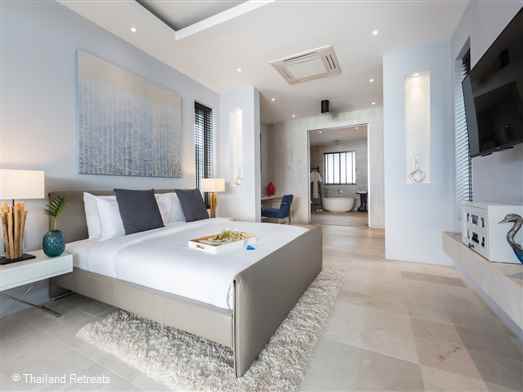 Each bedroom offers outrageously roomy ensuite bathrooms complete with lovers freestanding pod bath, double sink and power rain shower. 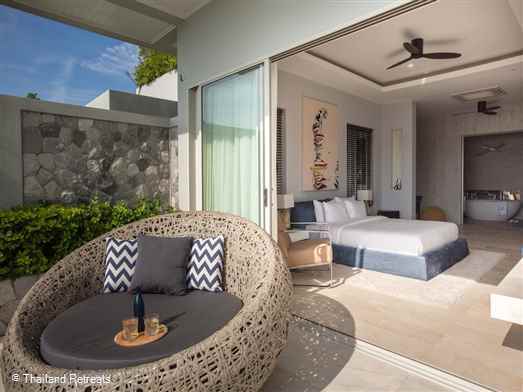 Should guests wish to retreat for some alone time, each of the bedrooms offer private covered balconies with sumptuous lounge seating immersed in island sea views. All bedrooms have flat screen smart TV’s with an IPTV media box and satellite TV with high-speed Wi-Fi, for an all-encompassing entertainment system. With such a unique island location YO Villa has been designed to provide stylish comfortable spaces for friends and families to come together and enjoy. The spacious indoor lounge features a large wrap around sofa with 65” flat screen smart TV’s with an IPTV media box and satellite TV with surround sound. 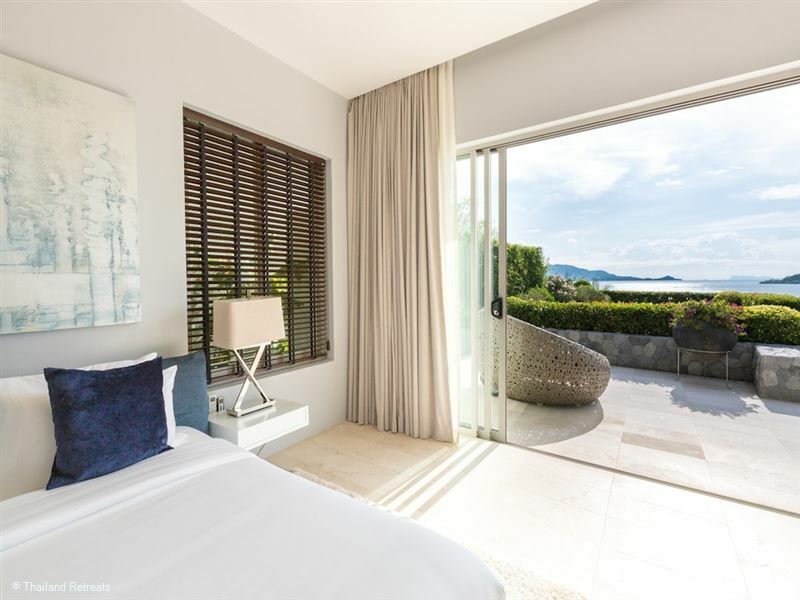 The floor to ceiling disappearing glass doors blur the division between indoor and outdoor living and can be easily closed so that guests can enjoy the cooling a/c with no compromise on the view. The elegant and comfortable covered outdoor lounge area opens out onto the infinity pool and is a gorgeous cool space to enjoy holiday time. 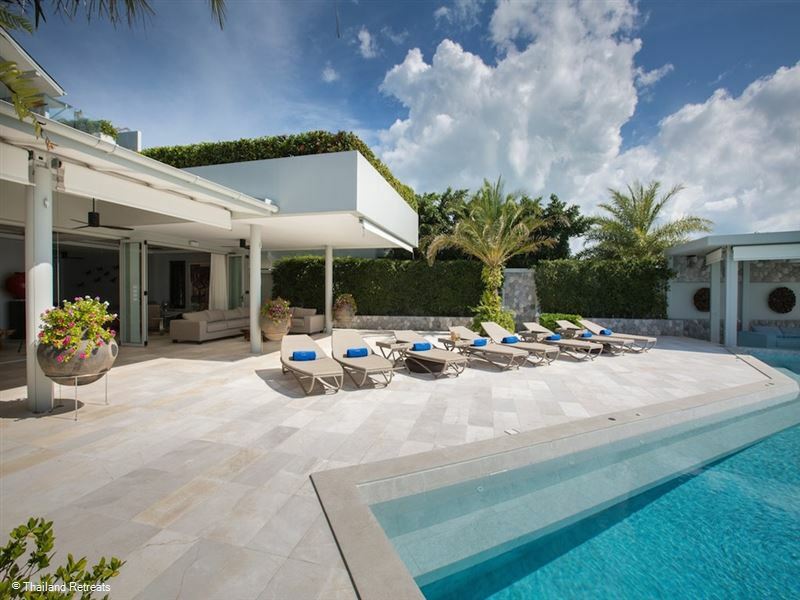 The poolside outdoor Sala offers a true alfresco experience in luxury island style with sumptuous sofa seating, ambient lighting and cooling fan for both day and night time enjoyment. Sun worshippers will not be disappointed with the large 17 metre wide pool deck enjoying all day sun with the wrap around 15 x 5 metre infinity pool tempting guests to take a dip and admire the sweeping panoramic views over Koh Som and the surrounding waters of the Gulf of Thailand. 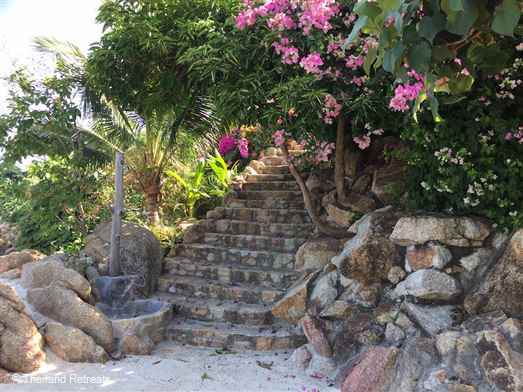 A semi private beach is located just a flight of steps down from the pool deck and comes complete with an idyllic rope hammock, loungers and an essential fridge for that cool beer and no reason to move. The impressive cinema room boasts state of the art 130” curved projector screen with epic 7.1 surround sound system with the most comfortable luxury custom made cinema seating. 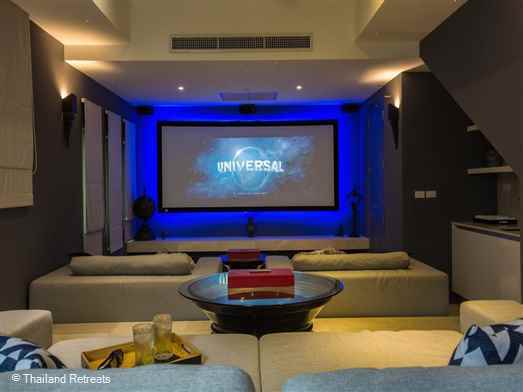 The incorporated design of the bar area adds a well thought out touch maximising the movie theatre experience. 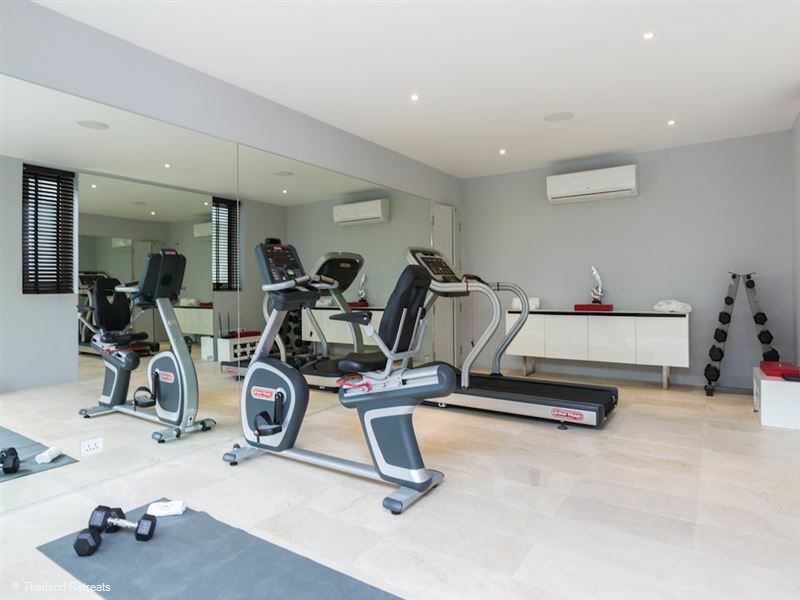 The private gym which is fully air conditioned offers guests the ability to enjoy their own self fitness discipline with the treadmill, elliptical, free weights, studio area for yoga/ pilates and pilates balls. 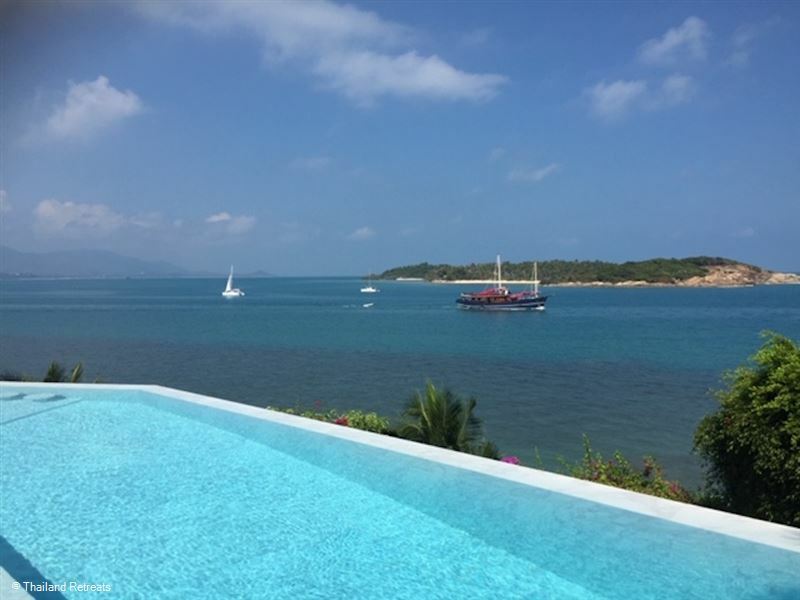 The large 17 metre lawned garden offers a beautiful space for guests to relax and watch the sun set in the cooling early evening or perhaps for guests to enjoy a late afternoon yoga session immersed in breathtaking views. The covered outdoor dining area close to the infinity edge pool is a gorgeous setting for meals during the day and night. 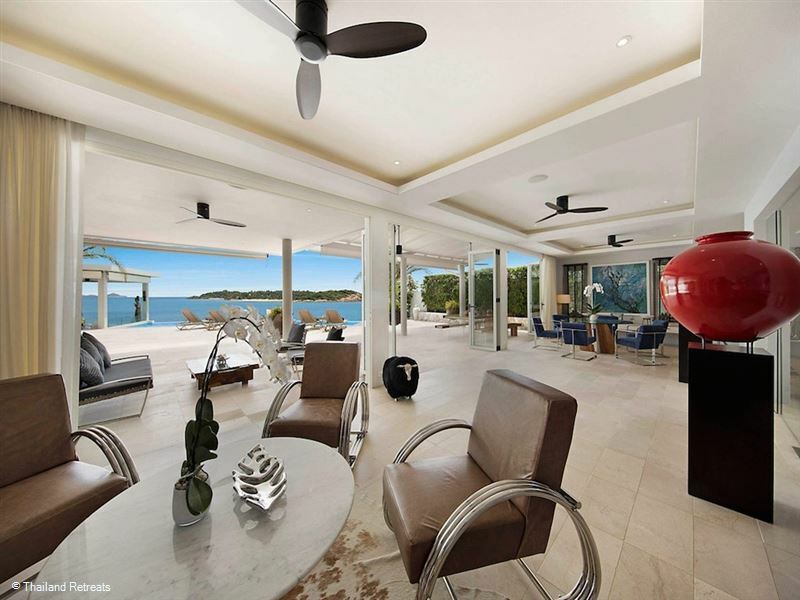 Should guests choose to dine in the comfort of air conditioning, the floor to ceiling glass doors can be closed off, with guests still able to enjoy the ambiance of the beach side setting. Sunset BBQs on the pool deck, a romantic meal by candlelight on the beach, or a catered pool party can all be easily arranged. 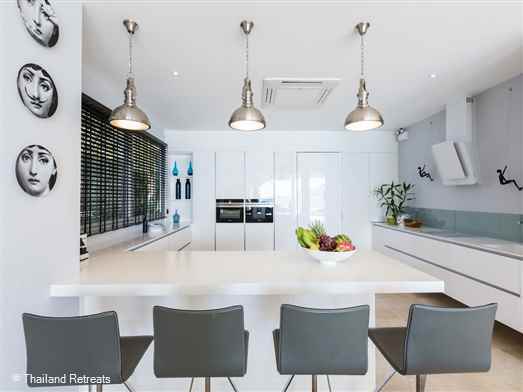 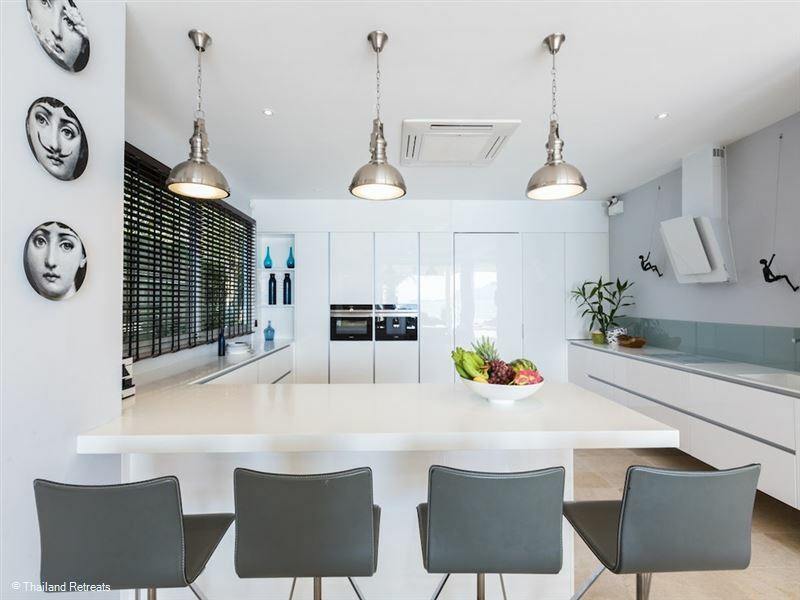 The high end western style kitchen with top appliances is open plan to the dining area and offers plenty of space for guests to prepare their delicious fare. 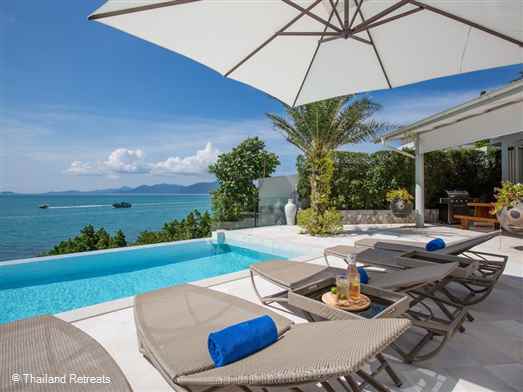 YO Villa is perfectly located close to the excitement of Chaweng & Bophut but far away enough to ensure a private holiday experience. 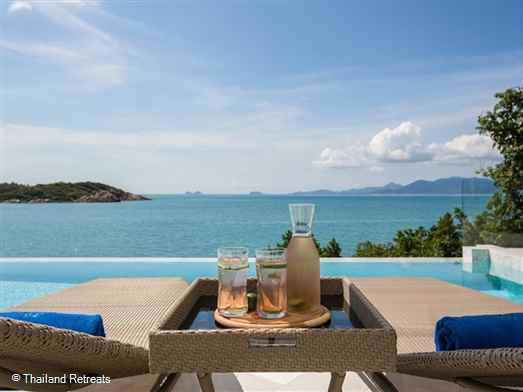 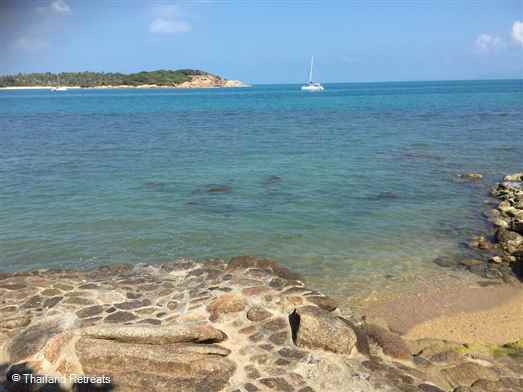 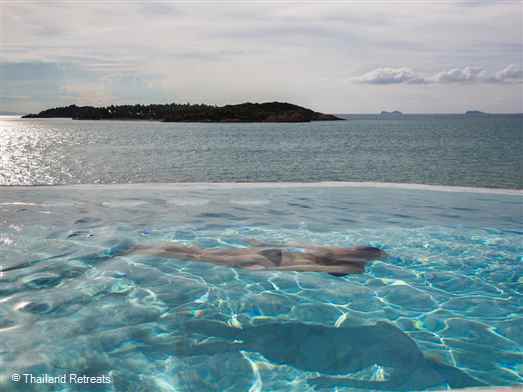 Six Senses, Tong Sai Bay & Melati form part of the 5 star neighbourhood in this, Samui’s most sought after location. 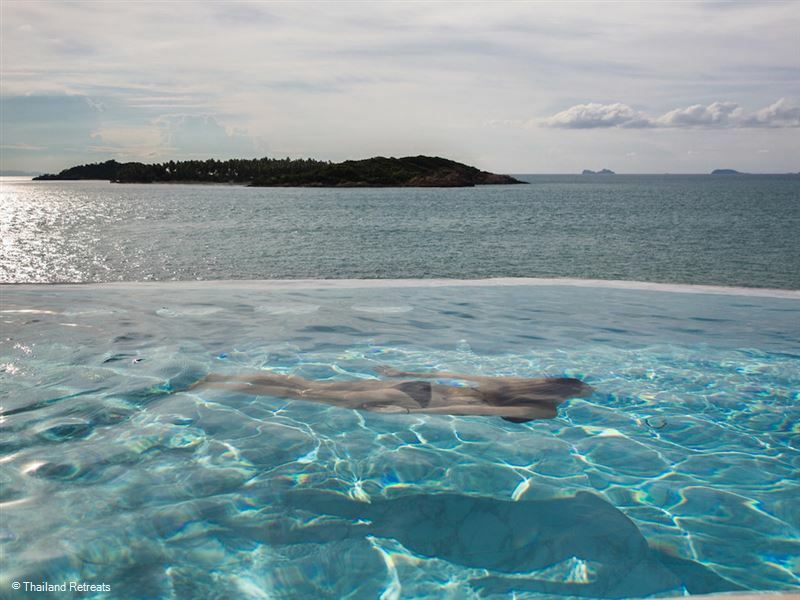 The villa offers a team of full time staff with English speaking Villa Manger working daily from 6.30am – 5pm. 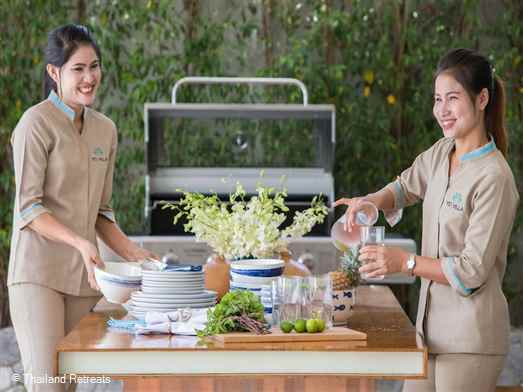 The housekeeping staff conduct themselves discreetly in cleaning up behind the guests ensuring that all the villa spaces are gorgeously presented throughout the day. The in-house chef service offers a delicious array of dishes both Thai and Western. 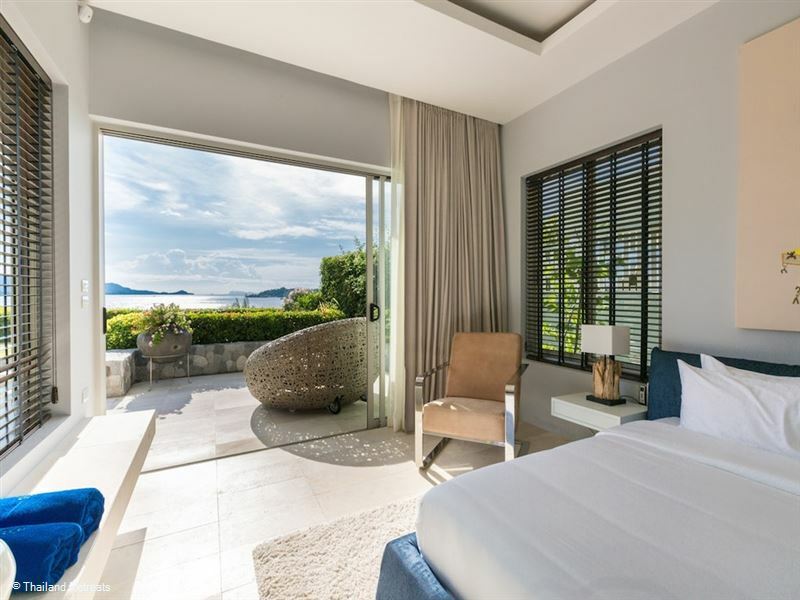 Guests can have daily meetings with the Chef and Villa Manager, planning menus and advising of any allergies or spice strengths. 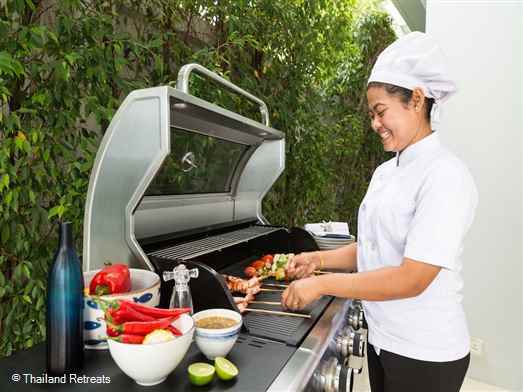 Should guests wish to cook some of their own culinary treats, staff are on hand to pre stock the fridge with their requests. The extensive wine fridge is stocked for guests pleasure and ease should they wish to purchase some fine wines during their stay. 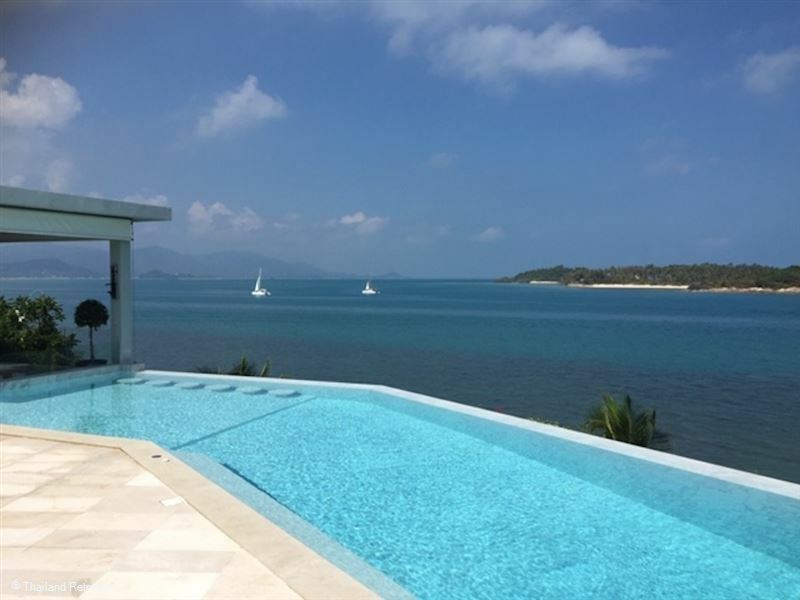 For special occasions or simply because guests are in holiday mode a mixologist service is offered at the villa for an extra charge to cater for guests cocktail delights. A spa menu is on offer for guests wishing to have in-villa massages, facials and manicure or pedicures. 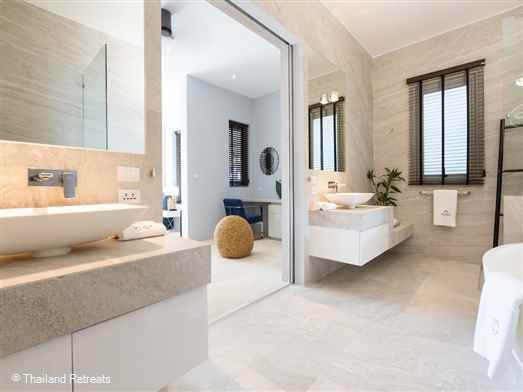 In the privacy of Yo Villa, guests can indulge and get pampered as they should in their holiday time. The private villa gym can also offer personal trainers, Muay Thai and yoga teachers for personal one on one classes or group sessions. With the spacious nature of YO Villa, guests wishing to use a private trainer for yoga on the beach or perhaps Muay Thai on the pool terrace, are welcome and invited to do so. 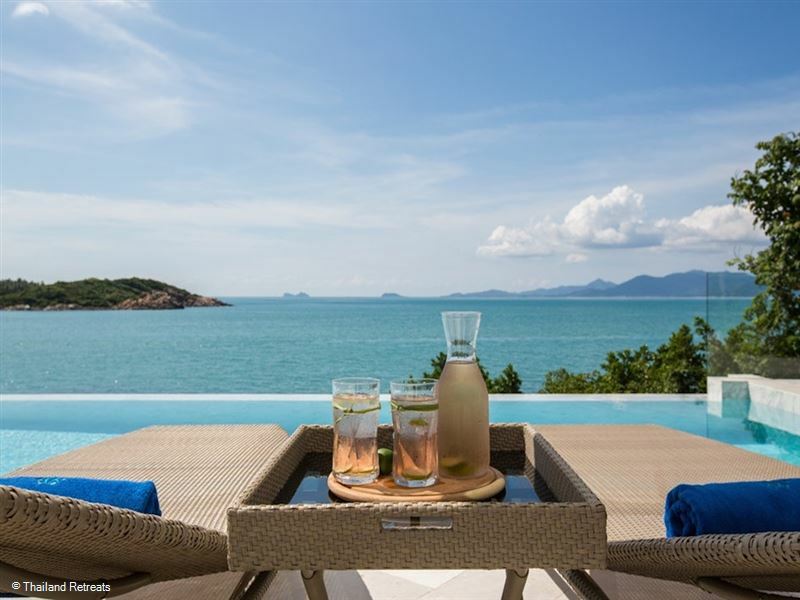 Kayaks for those going beyond the reef are there for guests to use as they wish, kayaking over to the neighbouring isle of Koh Som or perhaps round to next bay of Thong Sai is a safe and fun activity for all the family. 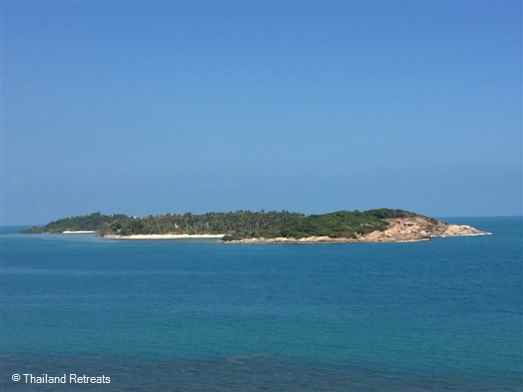 Exclusive pre arranged trips over to Koh Som island just a few minutes boat ride away to enjoy your very own private island BBQ, Picnic, romantic sunset dinner is all there for the taking. 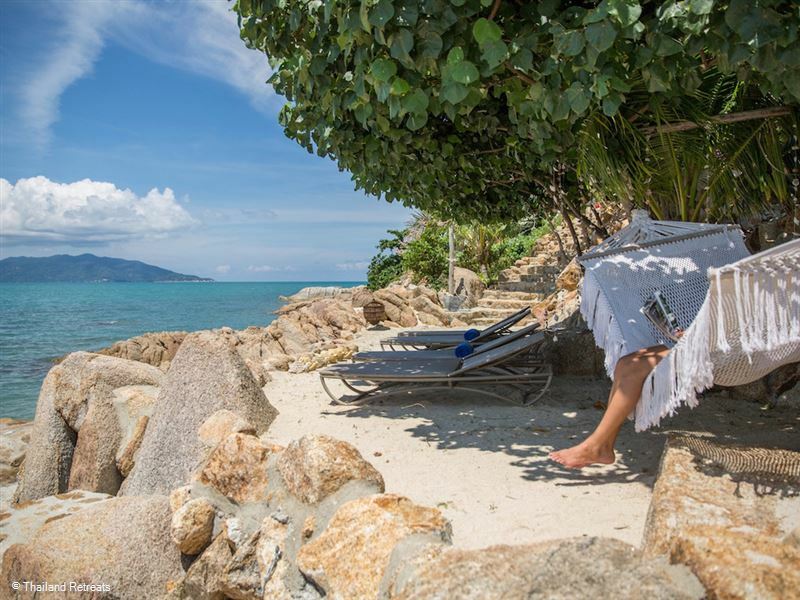 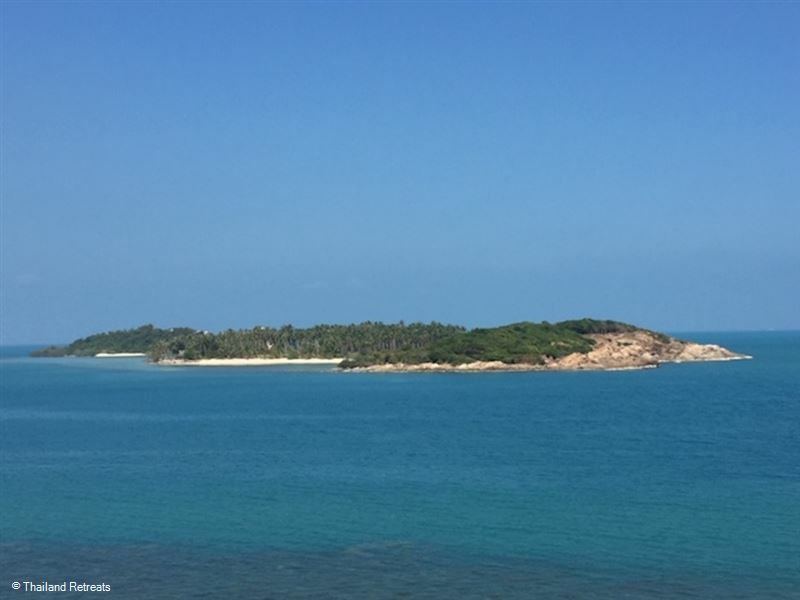 Guests can easily indulge in all kinds of island activities close to the villa, from shopping and nightlife in Chaweng, to restaurants and the Walking Street Market in Bophut’s Fishermans Village or even canopy adventures in the tropical rainforests of Maenam, nothing is to far away!